In this post, Andrea shares the benefits of carrot oil. It turns out it is really helpful for both the hair and skin. Carrots are a great source of a variety of vitamins, beta-carotene, and other antioxidants. They also have anti-aging properties, and they strengthen and moisturize hair. 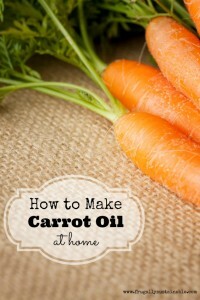 Andrea shares a great tutorial on how to make carrot oil. It’s a simple, heated infusion. She also includes some great photographs. Click on the How to Make Carrot Oil for Naturally Healthy Hair and Skin link below to see Andrea’s complete article.